This is an oriental style of making pancakes with red bean paste as the fillings. If you used to have pancakes with butter, maple syrup or honey. It’s good to have a try for this one. It’s all different in style and taste. Best of all, it’s very easy to make to impress your loved one(s). Cook red beans with water until soft, add some sugar to your taste. Or just buy some tinned red bean paste at any Asian stores if you like. Whisk eggs with water, add sifted plain flour and glutinous rice flour. Sprinkle salt and sugar. Mix well. Heat a heavy frying pan over low heat with a bit of oil. Add a small cup of mixture. Immediately move your frying pan with a circle motion in order to spread the batter evenly on the pan. Fry the batter on bother side until done, but don’t fry until brown. Remove and place on a big flat plate. 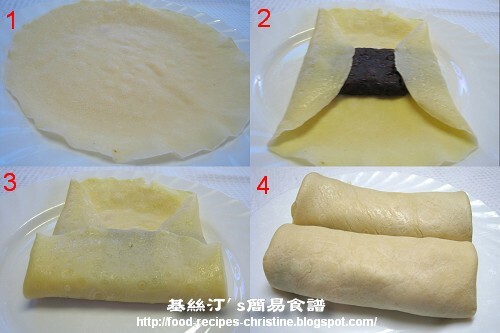 Put red bean paste in the middle of the pancake and fold sides to form a roll as the pictures show below. Heat 1/2 cup of oil over medium-high heat. 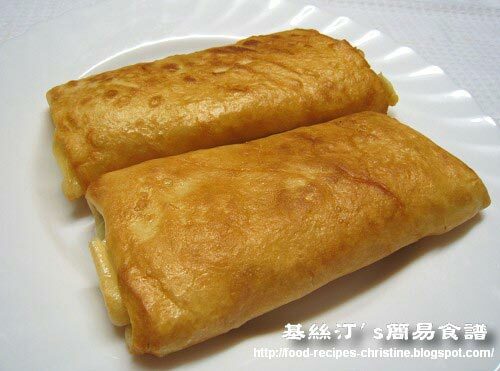 Put red bean pancake rolls in heated oil to deep fry until brown. Dish up and enjoy! If you don’t like glutinous rice flour, you can just leave it out. It won’t make the taste different at all. The glutinous rice flour helps the rolling job done nicer and easier. Where would I find Red bean paste? You can get sweetened red bean paste from any Asian stores. They are canned, labeled with something like this:"sweetened red bean paste", very handy. You can use it on the go. Use 1 part of red beans and 3 parts of boiling water to cook on low heat until all beans are softened. Add sugar to taste.That's it. For shortening cooking time, soak red beans more than one hour before cooking.